FIFA's long-time head Joseph "Sepp" Blatter has won his fifth presidential term after his opponent, Jordan’s Prince Ali bin al-Hussein, withdrew before the voting went into the second round. Blatter got 133 votes in the first round. He needed at least 139 out of the 209 votes cast on Friday to win outright. The vote was about to progress into the second round where a simple majority would have been enough, when Blatter's opponent Jordanian Prince Ali bin al-Hussein said that he had withdrawn from the race. Seventy-nine-year-old Blatter, who has already served four terms as FIFA president, had the assured backing of African and most Asian football associations, but the European Football Association (UEFA) stood firmly against him. Europe instead was expected to back Prince Ali, 38, who was FIFA vice president for the past four years. However, the ballot was secret and not every delegate announced their vote. Blatter's position was called into question just two days ahead of a vote in the midst of a high level corruption scandal. Fourteen FIFA officials and businessmen were accused by the US of bribery, fraud and money laundering. Several were arrested in a Zurich hotel where they gathered ahead of Friday's summit. Swiss prosecutors are also investigating the awarding of World Cups 2018 and 2022 to Russia and Qatar, respectively, to find out whether the vote went without any breaches. This prompted a wave of accusations against Blatter, who was deemed responsible for what was going on on his watch. On Thursday, the head of UEFA, Michel Platini, said: "People don't need a president like Blatter," and proceeded to pledge at least 45 of the 53 European votes against him. 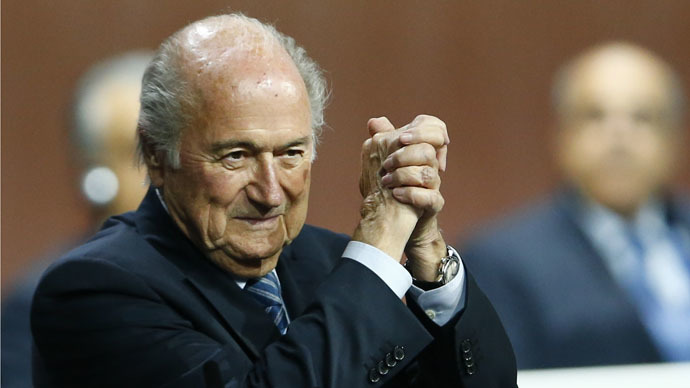 After his victory was announced, Blatter said: "We won’t touch the World Cup. I am a faithful man, God, Allah, whoever, they will help us to bring back this FIFA." He also promised this would be his final term as president: "At the end of my term, I will give FIFA to my successor. It will be robust. I like you. I like my job. I am not perfect. Nobody is perfect. Together we go." The next FIFA congress will convene in Mexico city on May 12 and 13, 2016.